Russian fortified city in the government of the same name; situated at the junction of the Viliya and the Niemen. There is documentary evidence that Jews lived and traded in Kovno toward the end of the fifteenth century. At the time of the expulsion of the Jews from Lithuania by Alexander Jagellon (1495) the post of assessor of Kovno was held by Abraham Jesofovich. By an edict dated Oct. 25, 1528, King Sigismund awarded to Andrei Procopovich and the Jew Ogron Nahimovich the farming of the taxes on wax and salt in the district of Kovno ("Metrika Litovskaya Sudebnykh Dyel," No. 4, fol. 20b). In the Diet of 1547 a proposition was submitted to the King of Poland to establish at Kovno, Brest-Litovsk, Drissa, and Salaty governmental timber depots, in order to facilitate the export of timber, and to levy on the latter a tax for the benefit of the government. This measure found favor owing to the claim that the Jewish and Christian merchants of Kovno and of other towns derived large profits from the business, while they at the same time defrauded the owners of the timber and encouraged the destruction of the forests. The proposition was adopted by the Diet and sanctioned by the king ("Kniga Posolskaya Metriki Litovskoi," i. 36). In 1558 a Jew of Brest-Litovsk, David Shmerlevich, and his partners obtained a monopoly of the customs duties of the city of Kovno on wax and salt for three years, for an annual payment of 4,000 kop groschen ("Aktovyya Knigi Metriki Litovskoi, Zapisi," No. 37, fol. 161). David of Kovno, a Jewish apothecary, is mentioned in a lawsuit (Oct. 20, 1559) with Moses Yakimovich, a Jew of Lyakhovich ("Aktovyya Knigi Metriki Litovskoi Sudnykh Dyel," No. 39, fol. 24b). By an agreement of about the same date between Kusko Nakhimovich, a Kovno Jew, and Ambrosius Bilduke, a citizen of Wilna, it would seem that the latter had beaten and wounded the Kovno rabbi Todros, and thatKusko, in consideration of 2 kop groschen, had settled the case and was to have no further claim against Bilduke (l.c. No. 41, fol. 120). From a decree issued by King Stephen Bathori Feb. 8, 1578, it is evident that Jews were living in Kovno at that time ("Akty Zapadnoi Rossii," iii. 221). Another document (June 19, 1579), presented to Stephen Bathori by the burghers of Troki, both Catholic and Greek-Catholic, and by the Jews and Tatars, contains their petition concerning the Christian merchants of Kovno, who had prohibited the complainants from entering the city with their merchandise, and from trading there; this in spite of the fact that the burghers of Troki had from time immemorial enjoyed the privilege of trading in Kovno on an equality with the other merchants, both Christian and Jewish, of the grand duchy of Lithuania. In reply, the king ordered the Kovno merchants not to interfere for the time being with the Jewish and other merchants of Troki, and promised an examination of the complaint at the end of the war then in progress ("Akty Gorodov Wilna, Kovno, i Troki," ii. 175). 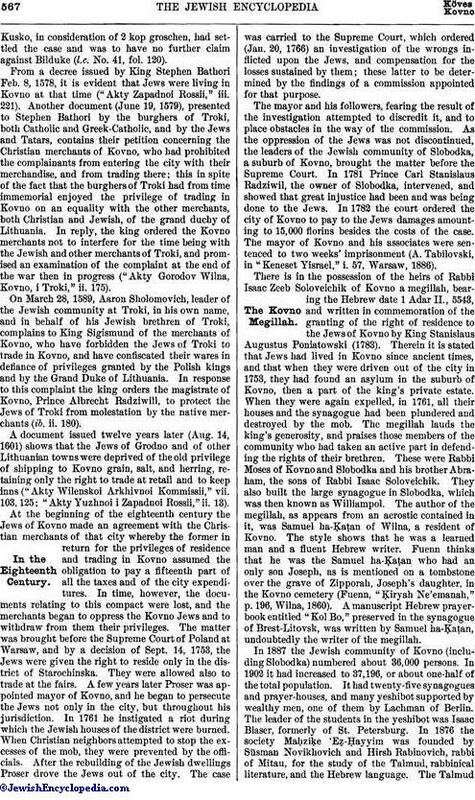 On March 28, 1589, Aaron Sholomovich, leader of the Jewish community at Troki, in his own name, and in behalf of his Jewish brethren of Troki, complains to King Sigismund of the merchants of Kovno, who have forbidden the Jews of Troki to trade in Kovno, and have confiscated their wares in defiance of privileges granted by the Polish kings and by the Grand Duke of Lithuania. In response to this complaint the king orders the magistrate of Kovno, Prince Albrecht Radziwill, to protect the Jews of Troki from molestation by the native merchants (ib. ii. 180). A document issued twelve years later (Aug. 14, 1601) shows that the Jews of Grodno and of other Lithuanian towns were deprived of the old privilege of shipping to Kovno grain, salt, and herring, retaining only the right to trade at retail and to keep inns (" Akty Wilenskoi Arkhivnoi Kommissii," vii. 103, 125; "Akty Yuzhnoi i Zapadnoi Rossii," ii. 13). At the beginning of the eighteenth century the Jews of Kovno made an agreement with the Christian merchants of that city whereby the former in return for the privileges of residence and trading in Kovno assumed the obligation to pay a fifteenth part of all the taxes and of the city expenditures. In time, however, the documents relating to this compact were lost, and the merchants began to oppress the Kovno Jews and to withdraw from them their privileges. The matter was brought before the Supreme Court of Poland at Warsaw, and by a decision of Sept. 14, 1753, the Jews were given the right to reside only in the district of Starochinska. They were allowed also to trade at the fairs. A few years later Proser was appointed mayor of Kovno, and he began to persecute the Jews not only in the city, but throughout his jurisdiction. In 1761 he instigated a riot during which the Jewish houses of the district were burned. When Christian neighbors attempted to stop the excesses of the mob, they were prevented by the officials. After the rebuilding of the Jewish dwellings Proser drove the Jews out of the city. The case was carried to the Supreme Court, which ordered (Jan. 20, 1766) an investigation of the wrongs inflicted upon the Jews, and compensation for the losses sustained by them; these latter to be determined by the findings of a commission appointed for that purpose. The mayor and his followers, fearing the result of the investigation attempted to discredit it, and to place obstacles in the way of the commission. As the oppression of the Jews was not discontinued, the leaders of the Jewish community of Slobodka, a suburb of Kovno, brought the matter before the Supreme Court. In 1781 Prince Carl Stanislaus Radziwil, the owner of Slobodka, intervened, and showed that great injustice had been and was being done to the Jews. In 1782 the court ordered the city of Kovno to pay to the Jews damages amounting to 15,000 florins besides the costs of the case. The mayor of Kovno and his associates were sentenced to two weeks' imprisonment (A. Tabilovski, in "Keneset Yisrael," i. 57, Warsaw, 1886). There is in the possession of the heirs of Rabbi Isaac Zeeb Soloveichik of Kovno a megillah, bearing the Hebrew date 1 Adar II., 5543, and written in commemoration of the granting of the right of residence to the Jews of Kovno by King Stanislaus Augustus Poniatowski (1783). Therein it is stated that Jews had lived in Kovno since ancient times, and that when they were driven out of the city in 1753, they had found an asylum in the suburb of Kovno, then a part of the king's private estate. When they were again expelled, in 1761, all their houses and the synagogue had been plundered and destroyed by the mob. The megillah lauds the king's generosity, and praises those members of the community who had taken an active part in defending the rights of their brethren. These were Rabbi Moses of Kovno and Slobodka and his brother Abraham, the sons of Rabbi Isaac Soloveichik. They also built the large synagogue in Slobodka, which was then known as Williampol. The author of the megillah, as appears from an acrostic contained in it, was Samuel ha-Ḳaṭan of Wilna, a resident of Kovno. The style shows that he was a learned man and a fluent Hebrew writer. Fuenn thinks that he was the Samuel ha-Ḳaṭan who had an only son Joseph, as is mentioned on a tombstone over the grave of Zipporah, Joseph's daughter, in the Kovno cemetery (Fuenn, "Ḳiryah Ne'emanah," p. 196, Wilna, 1860). A manuscript Hebrew prayer-book entitled "Kol Bo," preserved in the synagogue of Brest-Litovsk, was written by Samuel ha-Ḳaṭan, undoubtedly the writer of the megillah. 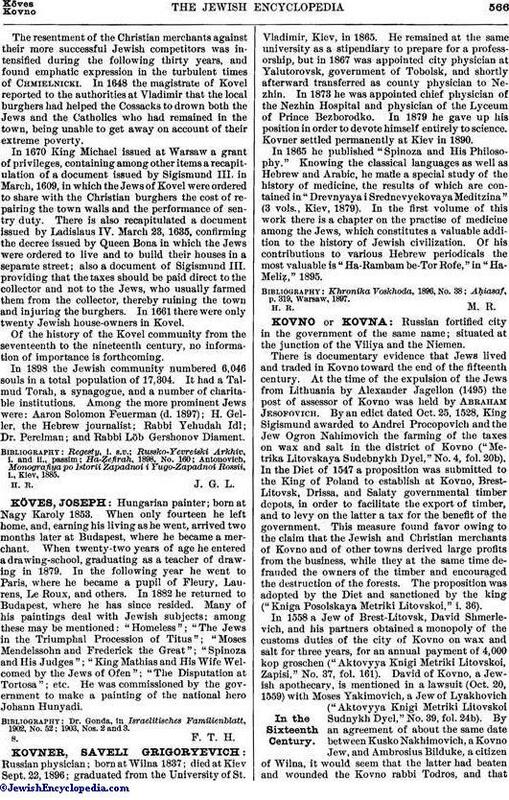 In 1887 the Jewish community of Kovno (including Slobodka) numbered about 36,000 persons. In 1902 it had increased to 37,196, or about one-half of the total population. It had twenty-five synagogues and prayer-houses, and many yeshibot supported by wealthy men, one of them by Lachman of Berlin. The leader of the students in the yeshibot was Isaac Blaser, formerly of St. Petersburg. In 1876 the society Maḥziḳe 'Eẓ-Ḥayyim was founded by Süsman Novikhovich and Hirsh Rabinovich, rabbi of Mitau, for the study of the Talmud, rabbinical literature, and the Hebrew language. The TalmudTorah has from 300 to 400 pupils, and a teaching staff of 6 "melammedim" and 6 teachers of Hebrew, Russian, and arithmetic. The annual expenditure of the Talmud Torah amounts to about 1,600 rubles, and is provided for out of the meat-tax and by private contributions, in addition to 15 per cent of the income from the cemetery. There is another Talmud Torah, situated in the more modern portion of the city, known as "Neuer Plan," and connected with the synagogue Naḥalat Yisrael. It has 50 pupils and 2 teachers. The non-Jewish middle-class schools in the city of Kovno showed in 1887 the following proportion of Jewish pupils: classical gymnasium for boys 104 Jews in a total of 369; classical gymnasium for girls 115 Jewish girls in a total of 310 ("Voskhod," 1888, iv. 4). The hospital was reorganized in 1813 by Benjamin Ze'eb ben Jehiel, father of Rabbi Ẓebi Naviyazer, and Eliezer Lieberman. They began a new pinḳes in place of the one lost at the time of Napoleon's invasion (1812), when the inhabitants fled, and the city archives, including the pinḳes, disappeared in the ensuing disorder. In 1854 Hirsh Naviyazer made great efforts in behalf of the hospital and succeeded in collecting enough funds to erect a stone building for the institution. In 1875 Tanḥuma Levinson and Ze'eb Frumkin reorganized the hospital on a modern basis. The annual income and expenditure are each about 15,000 rubles. There are accommodations for more than 600 patients; and 4,000 patients are treated annually in the dispensary. 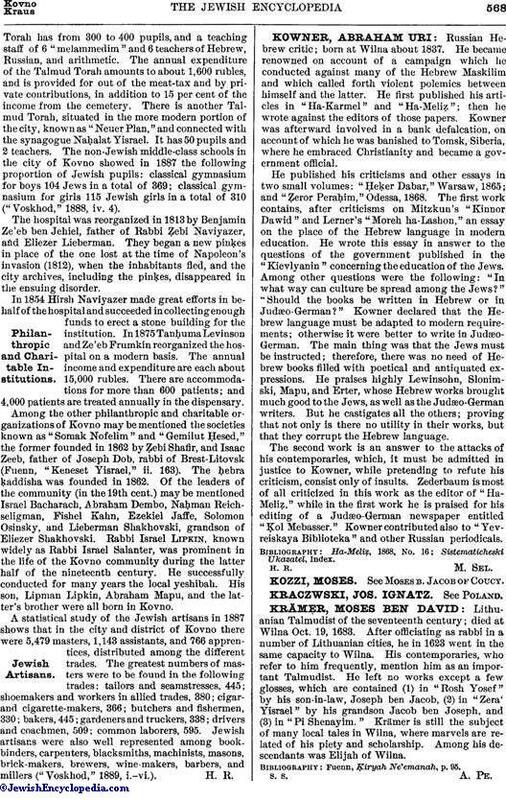 Among the other philanthropic and charitable organizations of Kovno may be mentioned the societies known as "Somak Nofelim" and "Gemilut Ḥesed," the former founded in 1862 by Ẓebi Shafir, and Isaac Zeeb, father of Joseph Dob, rabbi of Brest-Litovsk (Fuenn, "Keneset Yisrael," ii. 163). The ḥebra ḳaddisha was founded in 1862. Of the leaders of the community (in the 19th cent.) may be mentioned Israel Bacharach, Abraham Dembo, Naḥman Reichseligman, Fishel Kahn, Ezekiel Jaffe, Solomon Osinsky, and Lieberman Shakhovski, grandson of Eliezer Shakhovski. Rabbi Israel Lipkin, known widely as Rabbi Israel Salanter, was prominent in the life of the Kovno community during the latter half of the nineteenth century. He successfully conducted for many years the local yeshibah. His son, Lipman Lipkin, Abraham Mapu, and the latter's brother were all born in Kovno. A statistical study of the Jewish artisans in 1887 shows that in the city and district of Kovno there were 5,479 masters, 1,143 assistants, and 766 apprentices, distributed among the different trades. The greatest numbers of masters were to be found in the following trades: tailors and seamstresses, 445; shoemakers and workers in allied trades, 380; cigar- and cigarette-makers, 366; butchers and fishermen, 330; bakers, 445; gardeners and truckers, 338; drivers and coachmen, 509; common laborers, 595. Jewish artisans were also well represented among book-binders, carpenters, blacksmiths, machinists, masons, brick-makers, brewers, wine-makers, barbers, and millers ("Voskhod," 1889, i.-vi. ).